SOURCE GUARDIAN: Universal credit scheme will waste at least £140m, say MPsThe universal credit scheme has been overseen by "alarmingly weak" management, with systems so lax that a secretary was allowed to authorise purchase orders worth £23m, according to the public accounts committee. Margaret Hodge, the committee's chair, said that the pilot programme is not a proper pilot. "It does not deal with the key issues that universal credit must address: the volume of claims; their complexity; change in claimants' circumstances; and the need for claimants to meet conditions for continuing entitlement to benefit." 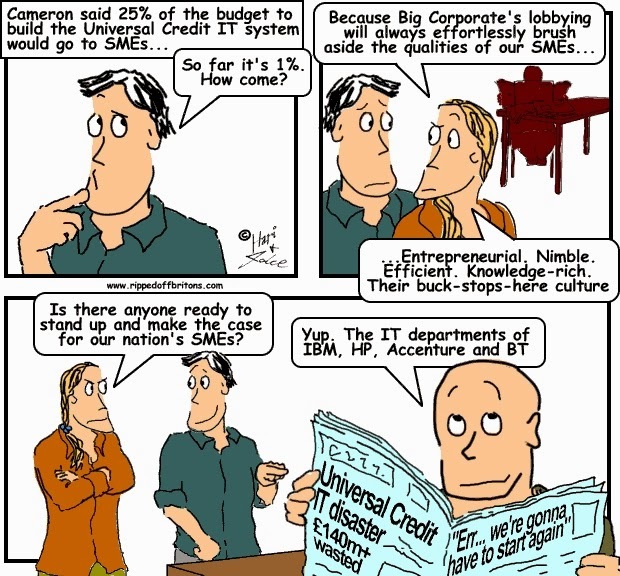 More than two years after prime minister David Cameron launched the coalition's SME initiative, aiming for government to do 25% of its business with small and medium-sized enterprises (SMEs), the Department for Work and Pensions (DWP) and its major IT suppliers have employed virtually no SMEs on the government’s biggest IT project. Less than 1% of the IT spending for the government’s flagship Universal Credit programme has gone to SMEs.